An Extension Swine Specialist with Kansas State University says a properly balanced diet is key to maintaining productive and profitable pork production. “Feeding Programs to Optimize Feed Efficiency and Carcass Quality of Grow Finish Pigs” was among the topics discussed as part of the 2019 Banff Pork Seminar. Dr. Joel DeRouchey, an Extension Swine Specialist with Kansas State University, says formulating a productive economical diet includes a balance of energy, protein, vitamins and minerals. Really, from and ingredient standpoint, when any nutritionist will balance a diet it’s really formulating to a potential energy level that we would want to achieve and that energy level then would allow different ingredients. Our cereal grains and maybe some of our byproducts like wheat shorts, distiller grains, bakery to potentially pull into the ration to partially substitute them if they provide that energy at a lower cost per calorie essentially. Really the same from an amino acid standpoint. 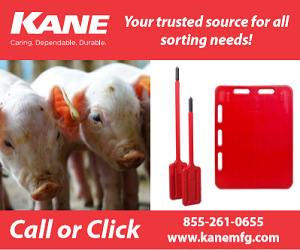 We allow our protein sources such as our synthetic amino acids, canola meal, soybean meal, peas, those would be our major protein or amino acid sources in our swine diets. While the protein sources I just mentioned, the reason we have them in is because of the amino acid levels, they also contribute energy. The same way our energy sources, our cereal grains, wheat mids, distillers, they also contain amino acids so they then use them to balance the diet as well so it’s those combinations to meet the needs of the pigs in the most economical way. Dr. DeRouchey says it’s still about dollars and cents and often we’re still fixed on what’s available. He says, if you’re in a corn growing area, corn is going to be your major cereal grain where as, if you’re in the western provinces, wheat and barley are going to be your main choices so it gets back to evaluating them correctly and understanding their nutrient content to balance the ration to get that complete diet.